Montague Island just off the coast of Narooma. First spotted by Captain James Cook in 1770, Montague Island has a rich history and our experienced guides are ready to share their knowledge on one of our guided Montague Island tours. Our Island tours include the opportunity to see lighthouse. Built in in 1881 the lighthouse boasts panoramic views of the Island and the beautiful New South Wales coastline. Montague Island tour. View from the lighthouse. The Island is also home to a large seal colony and as part of the Tour, we offer the chance to go snorkelling with seals in their natural habitat. We also offer a Little penguin tour where participants are able to watch the little penguins as they make their way back to shore after a day at sea. With a chance to get up close with dolphins, seals, penguins, whales and a range of bird life, book your tour with us today and make sure you don’t forget your camera!!! The Morning Montague Island Tour departs at 8.30am, this four hour tour features a two and half hour guided tour of Montague Island which includes a visit to the grave yard, seal colony, lighthouse and the southern end of the Island. 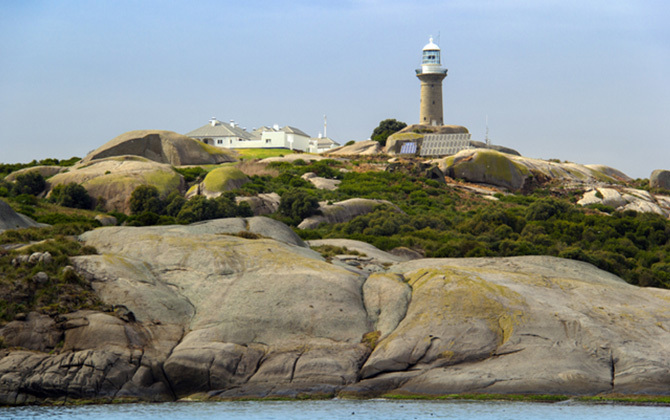 The Afternoon Montague Island Tour leaves at either 12:00pm or 1pm lasts three hours and includes a 1.5 hour guided tour of the Island, which includes seeing the lighthouse and a chance to see seals in their natural habitat and refreshments as well, you also have the option to snorkel with the seals. Our Montague Island and Snorkel tour includes a 1.5 hour guided tour of the Island including a chance to see the lighthouse, followed by a chance to explore the underwater world and frolic with playful seals in one of the Islands sheltered bays. Refreshments, snorkel, fins and masks are provided on this tour. Our Snorkel with the Seals tour does not include landing on the Island, but gives you a chance to see the Island from the boat, as we anchor up in the shelter bay at the island for you to snorkel with the playful seals and explore the water. Our Evening Penguin Tour includes a one-hour guided tour of the Island including the lighthouse and seal colony, refreshments and the chance to see the Island’s most popular inhabitants, the little Penguins as they return to shore. The departure time of this tour varies depending on sunset so please contact our office to confirm departure time. The evening Montague Island Penguin Tour runs from September to January. Guided Tour of Montague Island with a National Parks and Wildlife Ranger including seeing the lighthouse. Refreshments including water, soft drink, tea coffee, hot chocolate and morning or afternoon tea. Cheese platter for our evening penguin tour. Please note: All Montague Island Tours require participants to have a moderate level of fitness as you will need to climb a ladder at the jetty to get on the Island. For more information on any of our Montague Island Tours, or to inquire about diving or fishing tours, please contact our friendly local staff today. Bookings can be made online BOOK HERE – No upfront payment needed.